This post will educate people who have been wondering about how they can repack wheel bearings on their own. Knowing how to repack wheel bearings is going to save people money in the long run. Part of wheel bearings maintenance is repacking the wheel bearings because if you fail to do this, you might end up stranded in the middle of your trip. Repacking is challenging on a small-sized trailer that does not have brakes because you won’t have to push the shoes back or caliper. It is better to do it while the trailer is attached to the truck because its chances of falling off from the jack are huge. If your trailer has drum brakes, you can repack the bearings yourself. You are going to experience condensation can if wheels are not used for long periods of time because it can cause the wheel bearing to become rusty. The particulates of rust can scratch the surfaces of inside the housing of the wheel bearing. When there are scratches, it will cause friction and the bearing will fail to work. 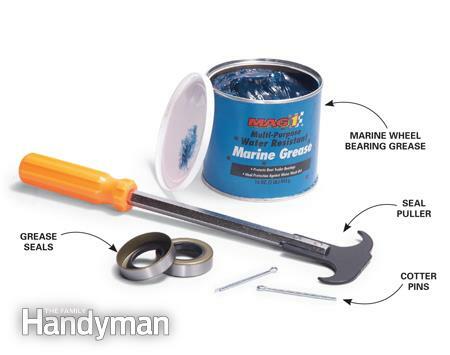 The steps that will be mentioned are also going to teach you how to repack boat trailer bearings. It won’t be necessary for you to the hub of the wheel unless it gets broken and there is a need for replacement. You can use a “channel lock” or chisel to remove the dust cap. Be careful not to cut through the cap because going too far can lead to this. If the drum has a hub, you need to know how to grease trailer wheel bearings. You first have to loosen the grease cap off that is found at the end of the hub, take off the cotter pin, and slide off the embattled nut that is on the spindle. You now have to loosen and remove the screw of the nut. In case the axle of the nut threads are not messed up, there is no need to use a wrench for turning the nut. There are times when it is helpful to spin the wheel for moving the nut and avoid using a wrench to make the nut tighter. Check if there are silver particles in the grease, or if there are rollers that are pitted or chipped. If this is the case, bearing replacement is needed. If the bearings outside are damaged, most likely the bearings in the inner part also need your attention. Start to pull the hub assembly off from the axle. In case you will use the grease seal again, make sure to provide support for the weight of the wheel so that the end of the axle is not going to ruin the rubber part of the grease seal. 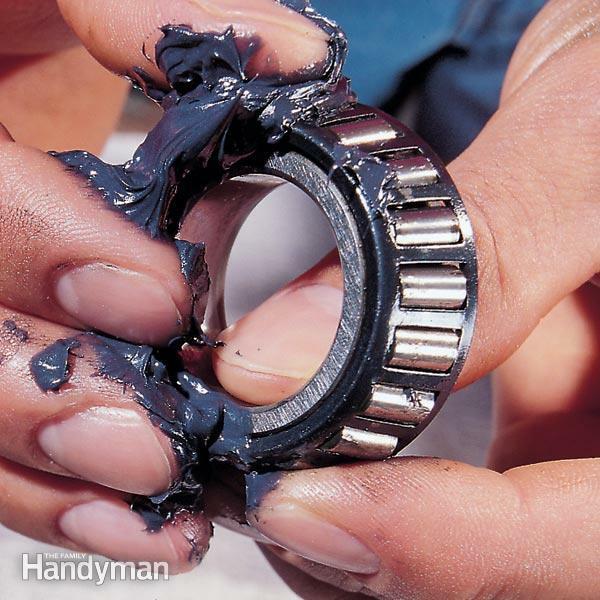 Roll the bearings using a clean paper towel to get rid of old grease. While cleaning, the bearings should be rolled in your hand and carefully study their surfaces to detect any damage or worn-out areas. If you have bearings that need replacement, go to the nearest trailer supply store and find an extra match. Remember to clean the hub too by utilizing paper towels to remove dirt and water. Take off the bearing from the inner part. Clean the two bearings that should have dirty grease all over them. If you remove a lot of grease using towels before using solvent, very little is needed to clean them up. See if the rollers have any pits, if there is any sign of this, you need to buy and place new bearings. Gather the old bearings and seals that are clean, so that the parts placed can be matched with them. Reusing the seals is not advisable because it can lead to complications later on. Turn the wheel over and put back the inner bearing to the hub after it has been cleaned and wiped. Take the new grease seal and place it inside the hub using the rubber side that is facing in. Tap the seal gently together with a thin piece of wood to place the new seal flat that goes against the surface of the hub. Once it’s been placed, apply more lubricant on the lip of grease’s seal. Put back the hub to the spindle that’s been newly assembled, using care in replacing parts that belong in the same order where they need to be removed. Apply a minimal amount of grease to the castellated nut, then put it on the castellated tab. Use your hand to tighten gently and clock the tab into place so it won’t become too tight and you won’t have a hard time later on. Spin the castle nuts until it comes to a stop, rotate the drum towards the opposite direction until a certain amount of resistance can be felt, then the cap on the wheel hub has to be put back. Do an adjustment of the wheel brakes. From inside the back of the wheel hub, you need to check the rubber cover, when it is removed, there is a notched star-wheel that will be exposed. In theory, when the hubs are filled with grease, it is going to keep the water away and your bearings will always be greasy making them last longer. You don’t necessarily have to take off the hub from the axle to put grease on the bearings, and all you have to do is plug on the grease gun and occasionally apply grease. This is why knowing how to pack wheel bearings is an essential skill you need to learn. You tend to use an additional amount of grease even if it does not require a lot to fill the entire bearing and if you need to fill the whole hub with grease, it takes 50 times more compared to only greasing bearings. When you are going to eventually take the hub of the wheel off, you are going to need plenty of greases to get rid of. There is a tendency for you to put air pressure on the grease seal without realizing it if you pump too hard, which could let dirt and water get into the hub. When you pump more grease into the hub, it may or may not sufficiently put grease on the bearings. This might or might not remove all the water from inside the hub. Eventually, the wheel bearings will begin to wear out. Seals of the grease are not built to last a lifetime, but you will eventually get the water inside the hub, then rust starts to form and bearings will fail. If you do not remove the bearings without doing a regular check on them, they will most likely fail, which usually happens while you are moving at high speed. Follow these tips to repack your wheel bearing to avoid any mistakes because it can cause some problems in the long run. You also wouldn’t want your trailer to stop in the middle of the trip because you neglected to repack the wheel bearings regularly. There is no excuse why you won’t be able to do it because these tips are all you need to follow. You also don’t have to ask someone else to do it if in case you are alone.